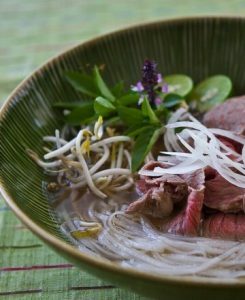 This is my favorite homemade pho recipe and it’s from Jaden Hair’s Steamy Kitchen. Jaden writes, It’s no secret that good Pho broth requires a gazillion hours of simmering time. Time that I just don’t have. Tony, a boyfriend from a lifetime ago, told me his Dad used to simmer giant vats of pho broth overnight for his little pho restaurant in Houston. So, one day, I thought it would be really genius to do the same. Dump a bunch of beefy, tendony, knuckley, marrowey bones into the largest stockpot that I have and let it simmer away while I slept. 11:30pm Initial hard boil of the bones to get all the yuck, guck and scum off. Char ginger and onion. 11:38pm Dumped out water, added clean water, the clean bones, spices, ginger and onion. Let the dance begin. 12:35am Is the flame low enough? Maybe I need to check to see. 1:23am Hmmm…I smell something funny. Go check. 2:41am What if it boiled over? Go check. 3:24am What if there’s a gas bubble in the pipe and the the stove spontaneously bursts out in big flames? Maybe I should sleep on the couch closer to the kitchen. 4:45am Gosh I’m hungry. Sneak a big spoonful of Ben & Jerry’s Pistachio Ice Cream. 4:51am Did I forget to put ice cream back in freezer? What if the gas bubble really does happen and stove spontaneously bursts out in flames? Then sleeping on couch is a dumbass idea. Crawl back to bed. 6:00am Kids wake up. Jumps up and down on my belly trying to wake me up. 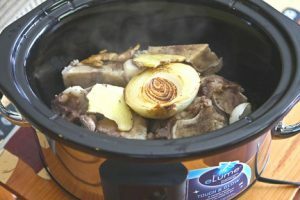 Whether you use the Crock Pot Pho method or the traditional stove top method, there are a couple of steps that you’ll need to do before throwing it all in the Crock Pot or slow cooker. Namely, toasting the spices, grilling the onion/ginger and pre-boiling the bones. These aren’t absolutely necessary steps…you’ll still make great pho…BUT these extra steps will make the difference between good pho and pho-bulous pho. You can buy Pho spices at most Asian supermarkets – you can buy the spices separately (coriander seeds, cloves, cinnamon, star anise, fennel and cardamom pod) or purchase them already mixed up in a package (which also includes a small mesh bag). 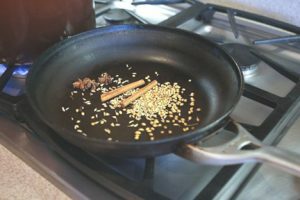 The quality of these pre-mixed spices are just okay – but sometimes it’s just convenient to pick up a bag, not to mention much cheaper if you don’t already have many of these spices. A Pho spice pack will typically sell for $1-$3. This day that I made the Crock Pot Pho, I used individual spices. I didn’t have cardamom pod. So yes, if you are missing one of couple of the spices, it’s okay. To get the best flavor from these spices, you’ll toast them in a dry skillet. 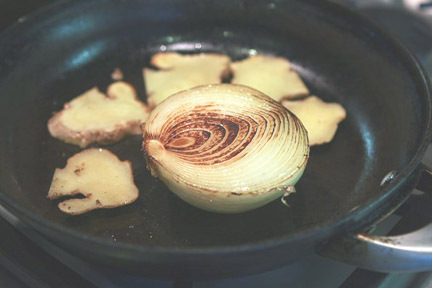 This is a totally optional step, but it really gives the ginger and the onion a deep, sweet, mellow flavor. When I’m making Pho the traditional stovetop way, I’ll char them in the broiler. But with the crock pot method, I didn’t want to use the oven at all. After toasting the spices (above) in a frying pan, I add a bit of oil and grilled the onion half and thick ginger slices. Knuckles, leg bones with lots of marrow are the best for making soup. The marrow will also make the soup rich and thick. The bones are pre-boiled for a few minutes on high heat to clean the bones and get rid of the nasty scum. You’ll bring a big stockpot of water to a boil on high heat. Add the bones and boil hard for 10 minutes. You’ll see brownish scum rise to the surface. If you hadn’t taken the time to pre-boil the bones, all that scummy stuff ends up in your soup. Drain, discard the scummy water and briefly rinse the bones. Now you’ll add the spices, ginger, onion and bones to the slow cooker. Fill with fresh, clean, cool water about 1-1/2 inches below the surface. Set your slow cooker on low for 8 hours. I haven’t tried this method on high, but I’m sure it would be just fine. So let this cook during all day while you’re at work or at night while you sleep and you’ll be rewarded with the cleanest, best tasting pho soups ever. Because the slow cooker doesn’t let the stock boil hard, it’s safe, easy and convenient. Here’s what the stock looks like when it’s been cooking for 8 hours on low. Notice that the level of the liquid is still pretty high. The low, even setting doesn’t evaporate the precious liquid as much as a stove top can. The stock is strained before serving. I used different ingredients than my previous version of traditional Vietnamese Pho and I wanted to highlight them. Instead of using dried rice noodles, I used fresh rice noodles found at Asian markets, in the refrigerated section because all these need is a quick dip in boiling water. Very fast! I also bought a package of Vietnamese Beef Balls (called Bo Vien Dan). There are all sorts of balls – beef, pork, chicken, fish, crab, and my favorite – beef tendon. They come frozen in a package and they are pre-cooked, so all you need to do is throw the frozen balls into the same pot of boiling water as you cooked your noodles in. Just boil for a couple of minutes until the beef balls are heated through. I like cutting these beef balls in half, so make them easier to eat. It’s not so pretty trying to stick an entire beef ball in your mouth. Unless…you’re like really into that. 1/2 pound flank, london broil, sirloin or eye of round steak, sliced as thinly as possible. 1. Bring a large stockpot with water to boil over high heat. 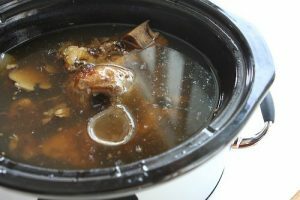 When it comes to a rolling boil, add the beef bones and boil vigorously for 10 minutes. 4. When you are just about ready to eat, you’ll prep the rest of the ingredients for the Pho bowls. Bring a pot of water to a boil. Add the beef balls and cook until heated through, about 2 minutes. Remove the balls, keeping the water boiling and now cook the noodles according to package instructions. If you are using fresh noodles, all they need is a couple of minutes. Drain immediately. 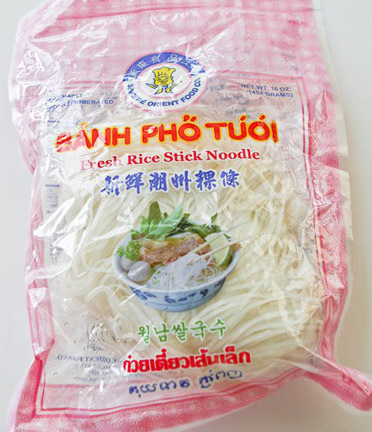 I use frozen fresh rice stick noodles — not dried — in soups. I ‘d use dry rice sticks for deep frying. Andrea’s comment: I use fresh rice stick noodles because those are what the restaurants use in their pho. It can be found in the frozen section of your oriental market. Dry rice sticks are not the same texture. The dry rice sticks are better for frying. This entry was posted in Uncategorized on December 13, 2016 by goddess.